Independent control of the different modules via separate power supplies and processor circuit boards. In this way, should errors occur, one module can be stopped or serviced while the others continue to synthesize. 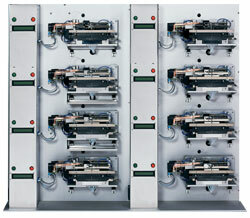 The modules can be run separately with different synthesis programs and at different scales. Separate DMT monitoring for all 96 columns. as is used in the proven 10-column synthesizer. The entire DNA Synthesis Workstation can be provided with reagents from a central source and the consumption monitored. The reagents are supplied from large-volume reservoirs that can be customized to the synthesis scale of users. In this way frequent refilling of reagents is rendered unnecessary. (length x depth x height).